It's known as the fashion world's Oscars, but it's a lot more than just a red carpet event. To fashion diehards, the first Monday in May can only signal one thing: the annual Met Gala. 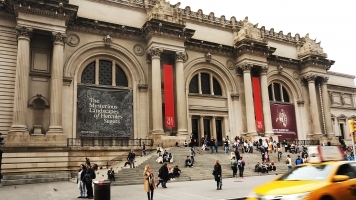 The black-tie extravaganza is held at New York City's Metropolitan Museum of Art. But it isn't just about the over-the-top outfits worn by celebrities on the red carpet. The Met Gala is actually a fundraiser for the museum's Costume Institute, which is the only department that has to finance itself. That's probably why tickets to the event cost $30,000 a pop this year. The party's been held almost every year since 1948. But the event became much more celebrity-focused after Vogue's current Editor-in-Chief Anna Wintour took over the party-planning reins in 1999. "I thought he wasn't coming." "I know, but then he decided he wanted to come." "OK, can he not be on his cellphone the entire time then?" The Costume Institute's spring exhibition dictates the theme of that year's Met Gala. And attendees — about 600 in total — are encouraged to dress the part. Some notable looks over the years include Rihanna's gigantic gold dress at the 2015 "China: Through the Looking Glass" event. It weighed 55 pounds. And Claire Danes wore a dress that actually lit up to 2016's technology-themed party. The 2017 exhibition honors Japanese designer Rei Kawakubo. It'll be the first time since 1983 that the museum's exhibit is featuring justne living designer. What happens after the red carpet isn't publicized in any way, since the guests aren't supposed to use social media, though that rule is often broken by celebs wanting to take a selfie or two. The New York Times does say guests tour the exhibition before sitting down to dinner and a musical performance.